When you think about Ram trucks, I’m sure the iconic big rig styling of the Ram’s front end come to mind. Words like work-truck, hauler and farm truck may also ring a bell. 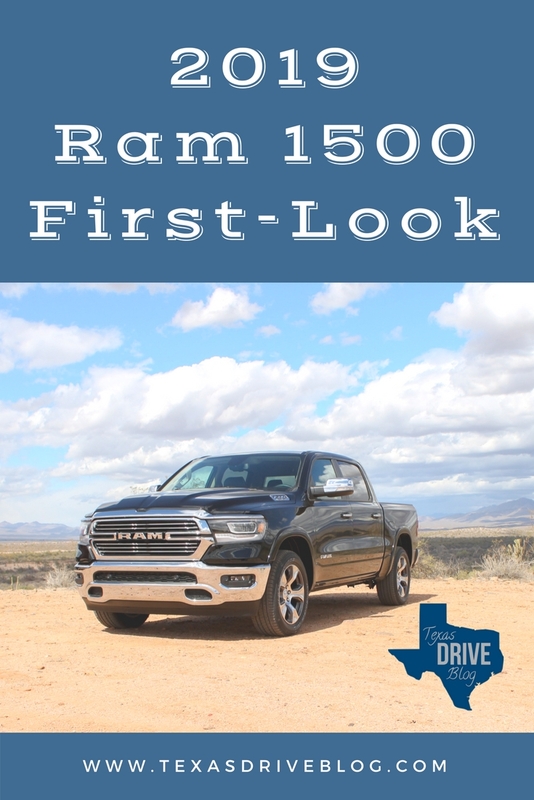 But the 2019 Ram 1500 brings so much more to the table. Sure’s it’s the most capable light-duty truck to hit the market this season. With a towing capacity of 12,750 pounds, the 5.7L HEMI® V8 engine with eTorque technology give you an incredible 395 horsepower. The 410 pound-feet of torque and a supplemental 130 pound-feet of torque provide improved efficiency all around. Power, torque, and towing capacity. Check. 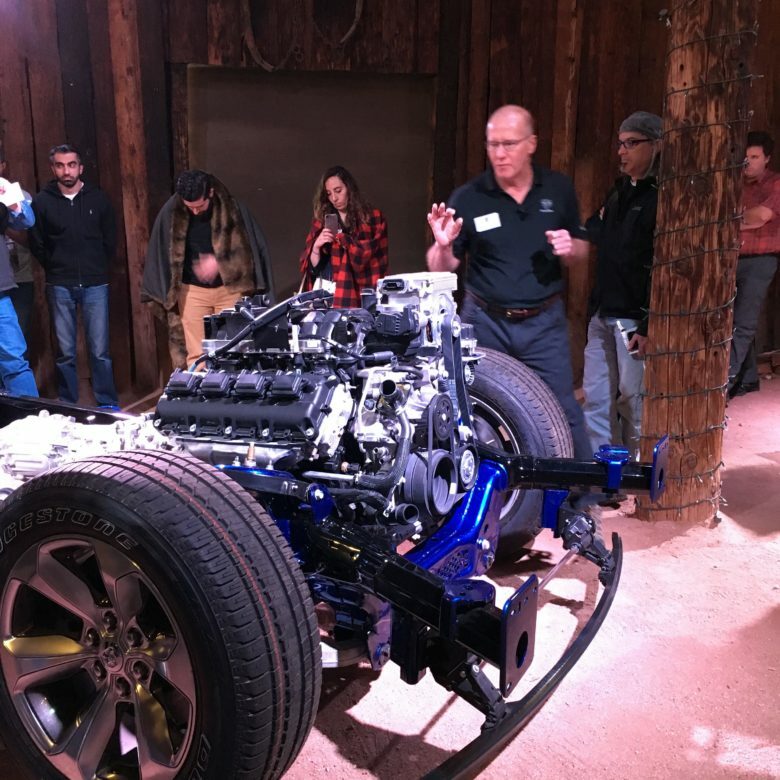 I had the privilege of being one of the first people in the world to drive the 2019 Ram 1500 v8 Hemi at the global launch event in Scottsdale, AZ earlier this month. Half the fun of the event was watching all my fellow journalists and media friends from all over the world get excited about all the new technology, safety features, and increased fuel economy. There’s no doubt it’s a Ram truck. The unique stance remains. But there are a few not-so-subtle differences to note. My favorites are the new narrower headlamps. To me, they add a sleekness to the front end and make the whole truck look faster and agiler. The second change I love is the seamless bumper. Thanks to the amazing Ram designers, all the sensors for the safety technology have been hidden amongst the grill and light lights, leaving you with an uninterrupted seamless bumper that is just clean. A few other design changes to note on the exterior are the raised lower edges of the windows, and the bevel a little further down, that makes a nice clean line for the eye to follow from the cab all the way to the tailgate. This continuity means that no matter which cab and bed configuration you choose, the finished pairing looks solid. You’ve never seen an interior like the Longhorn Edition’s. Genuine leather (pretty much every surface is wrapped!) barn wood, and metal with filigree accents everywhere you look. The texture and color combinations are out of this world luxurious while retaining all the rustic notes you’d expect to find on a pair of boots or a fine saddle. And for the ladies… an adjustable headrest means you can wear a ponytail while driving, without having to put the seat way back. Genius! And if you think all that luxury is reserved for the front row, think again! Ram knows that work trucks like the Bighorn haul crews of men. And families have started looking to the Quad Cab configurations for family cars. So they took the consumer’s expectations and exceeded them. They added 4″ to the cab… an inch up front and three inches in the rear. This provides more legroom for both rows, but it also allows the rear seats to slide forward a few inches so the backs recline up to 8 degrees. I tried this new feature and fell in love. It’s so comfortable. Anyone could sleep on a road trip! 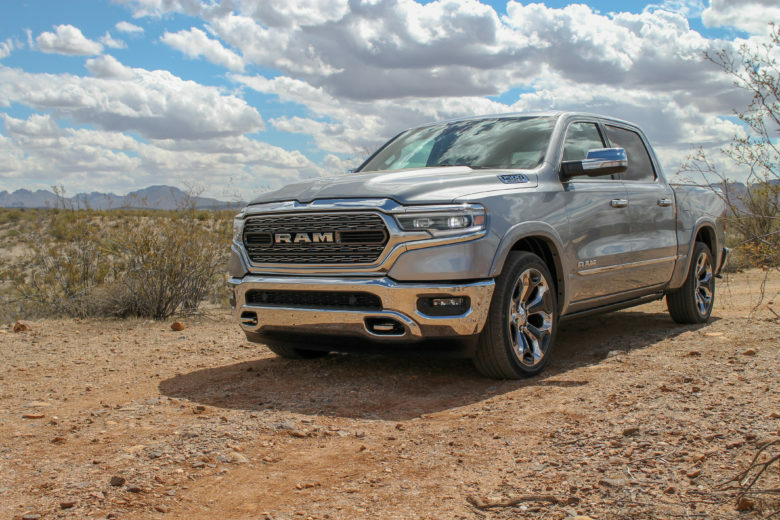 Ram also offers vented back seats, a fold-down console, a panoramic moonroof, about 3 million charging ports (only a slight exaggeration) and more storage than any truck in its class. My drive partner and I got a special interior tour of the Longhorn Edition from the 1500’s interior designer, Jon Gaudreau. He showed us some of the Easter Eggs hidden throughout the truck. One of these is in the redesigned Ram Bin tucked into the floor of the rear cargo space. Just lift the carpet and you’ll expose a box on either side… just right for holding some ice and sodas, or your latest catch. Forgot your tape measure? No worries. The Ram Bin has a built-in measuring line so you can document the big ones that didn’t get away. Under the front center console’s lid is another special treat just for builders. When you see stuff like this you get the idea that the people behind this truck aren’t looking just to give you a great truck. They want this truck to be a part of your story. All the Technology of a High-end Passenger Car – In a Truck! 12″ of touchscreen smart-goodness. Stop. The Uconnect 4 system is unlike anything you’ve ever seen in a pickup truck. Yes, it’s massive. But it’s also smart. Split-screen capable so you can keep your Nav or Music visible up top while navigating climate controls and other apps on the bottom, this system takes things to a whole new level. Music lovers like myself will geek out over the new music profiles. Set your favorite stations and songs and the system will remember your preferences. It can then suggest new things to listen to. And another driver gets in they can switch to their own profile and enjoy their own favorites. Adaptive cruise, lane assist, collision warning, blind spot monitoring (more on that in a minute! ), park assist… pretty much any safety technology you’ve ever heard of has been brought to the 2019 Ram 1500. Usually, you’ll see this stuff on your more luxurious packages for sedans and crossovers. Maybe a few larger SUV’s designed to be family cars. But pickups? Nah. I think Ram’s inclusions of these safety features shows just how in-tune they are with their growing audience. Yes, the truck can be the family’s vehicle of choice for trips and daily driving, and these safety features are going to make it stand out from the crowd! When you shave off almost 300 pounds of weight thanks to redesigning the frame and using high-strength steel, you end up with better fuel economy. But Ram didn’t stop there! They also added an air damper that lowers under the front bumper when you reach speeds of 35 mph. This damper decreases drag and increases aerodynamics which we all know equals better fuel economy. This damper comes standard on every Ram 1500 that isn’t air-ride equipped. 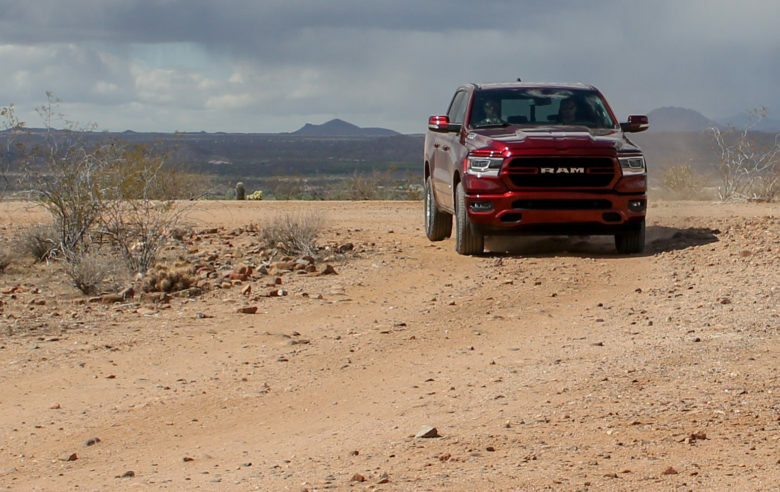 And, it’s smart enough to disengage when you enter 4-wheel drive mode so it stays tucked up under the truck and safe while you’re out rock crawling or flying through a sandy desert like we did in the 2019 Ram Rebel. In my opinion, this is the most improved truck on the road this year. Why? Well if you’ll remember I wasn’t a huge fan of the old Ram 1500 that I drove last year. Now? I’d totally own one and I’m going to have to add it to my lineup of favorite trucks.